During the week of June 15, archaeologists from the State Museum of Pennsylvania and Temple University tested a prehistoric Native American site along the Lehigh River in Lehigh Gorge State Park, Carbon County. The site (designated 36Cr142 in the Pennsylvania Archaeological Site Survey files) was brought to our attention by local amateur archaeologists who were alarmed that it was being looted and valuable archaeological information was being lost. It was reported that artifacts from the Transitional period (3000-4200 years ago) and the Late Archaic period (4200-6000 years ago) were the focus of the looters. The Transitional/Late Archaic period is a time of significant change throughout the Middle Atlantic region. Native American cultures were experiencing new technological developments, a dramatic increase in trade and the first widespread examples of ceremonialism. The hallmark of the Transitional period is the broadspear. The one pictured below is of the Perkiomen style and it was recovered less than 3 feet from the surface. The asymmetrical blade suggests it was also used as a knife. We felt it was important to learn more and document this site before it was completely destroyed. With the assistance of local volunteers, we conducted a week long investigation to determine the extent of the destruction and the potential for earlier occupations. In addition, as part of our visit, we were hoping to educate the local archaeological community as to the advantages of proper excavation techniques but also to make it clear that further looting would not be tolerated. The site is located on state property and it is protected under Section 511 of the State History Code. Collecting or digging for artifacts on state land is punishable by a $2500 fine and/or a year in jail. Over a period of six days, we expanded two looters pits into an 8 X 14 foot unit and a 7 by 7 foot unit. The site is stratified although the top 3 -4 feet have been extensively dug-up by looters. The excavations proceeded by natural and cultural levels and all soils were screened through ¼ inch mesh. The work was hampered by rain storms but one unit was partially excavated to the bottom where a layer of cobbles representing the Ice Age stream bed were encountered. No artifacts were recovered from this depth and we assume this level dates to approximately 12,000 years ago. This project only sampled a small portion of the site but we have been able to generate several working hypothesis. The site was occupied by at least six different Native American groups between 3000 and 9500 years ago and possibly earlier. We were able to develop a good description of the soil stratigraphy and the different occupations can be correlated with distinct soil strata. Although the Transitional/Late Archaic occupation has been adversely impacted, the Middle Archaic occupation, dating to between 6000 and 8500 is largely intact. Middle Archaic times are one of the most poorly understood periods in the region and this site has the potential to greatly increase our understanding of Native American culture during this time. 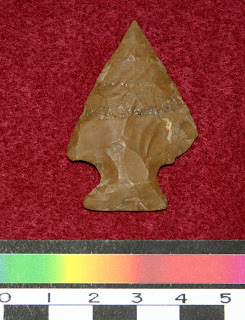 The bifurcate based projectile point (of the LeCroy type) was found at over 4 feet below the surface. In addition, there were artifacts below the Middle Archaic occupation, probably dating to the Early Archaic or even the Paleoindian period and these would also be very significant. This site clearly has the potential to add new and significant data to our understanding of Native American cultural behavior in the past. Towards that goal, Temple University is planning to continue the investigation with a college field school planned for the summer of 2010. This tiny porcelain doll was recovered from the Gayman’s Tavern Site (36DA169), formerly located in Dauphin, PA, by McCormick Taylor & Associates, Inc. The main block of the tavern was constructed in 1863 and the building ceased operating as a tavern in 1888, by 1890 it had become a private residence. These dolls are commonly referred to as Frozen Charlottes and range in size from one to eighteen inches, with no moving parts. The smaller one inch varieties were usually sold for a penny making them accessible to many children. A popular custom of the time, although not recommended today, was to bake them into a cake thus leaving the luckiest child to find a prize when biting into the cake. Legend has it that the name Frozen Charlotte comes from an American folk tale about a young maiden who set out for a party and against her mother’s wishes, she refused to dress warmly enough for the inclement weather. As a result she froze to death before arriving at the party. Surely this tale is meant as a warning to all young ladies to mind their mother’s warnings when setting out under such conditions and dress for the weather, even if it is not fashionable. Archaeologists are commonly asked the questions, “Have you found any dinosaurs?”, or “Did you find any gold?” Any field technician worth his or her weight in gold will hopefully correct the inquisitor, by first stating that archaeologists don’t dig for dinosaurs, paleontologists do. As for the matter of gold, such a valuable commodity is normally guarded very closely by its owner and hence rarely finds its way into the archaeological record, the exceptions being extraordinary sites such as a sunken pirate ship or a pharaoh’s tomb. Sadly, sites such as these, the vast majority of archaeologists will never have the occasion to excavate. Now silver, on the other hand, is more of a working man’s precious metal and its appearance on archaeological sites often, but not exclusively, in the form of currency, acts as an indicator of the general population’s interaction with the material. Believed to be the only example in the State Museum of PA’s Section of Archaeology collection of over 4 million artifacts, depicted here is an 1852 US three cent piece. Combining the suffix tri (for three) and dime, the coin was nicknamed the “trime”. Minted in Philadelphia and composed of 75% silver, 25% copper, it is the smallest silver coin produced in the United States and weighs just eight tenths of a gram. This coin has survived in amazing condition when one considers it was recovered from a subsurface context in relative close proximity to an active stream channel. Excavated from Montgomery County prior to bridge replacement activities conducted by PennDoT, this “trime” is a welcome addition to the collection and represents just one of a dizzying array of sizes and unusual denominations that seem to be characteristic of 19th century American coinage. These stone artifacts, some with unusual incised decorations, were uncovered in a Native American cache (storage pit) by a contractor, who was "mining" topsoil along the North Branch of the Susquehanna River in Luzerne County. 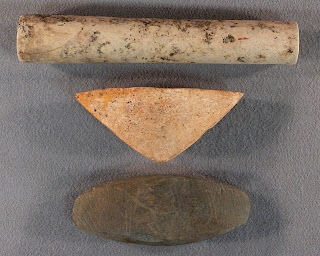 Artifacts in the image from top to bottom are 1) stone tubular pipe, 2) boatstone, which is a ground stone artifact whose name is derived from its boat-like shape and 3) bar celt or whetstone with incised lines on both surfaces. Celts were utilized by Native peoples for woodworking and whetstones were used for polishing and grinding other stone tools. The contractor also noted dark stains in the soil and decided to contact a local professional archaeologist to further investigate. Mr. Al Pesotine of Pan Cultural Associates excavated the stains which yielded a storage pit utilized by Native peoples to store foods, similar to a cellar today. Carbonized wood recovered from the pit was radiocarbon dated to 570 +/- 50 B.C. (the Early Woodland Adena period). 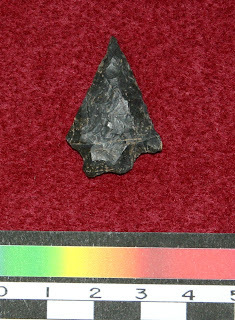 There are very few documented finds of the Adena Culture in the Upper Susquehanna Valley. The landowner kindly donated this unusual cache of artifacts to The State Museum of Pennsylvania in 1997.